Last September the whole Little Viking Horse herd decamped, and went on a Grand Expedition to Wales. It was not my first time, I am quite famous in Wales already, but it was the first time we all went together. In these dark and damp winter days, Fleygur Fans might enjoy reading about it. 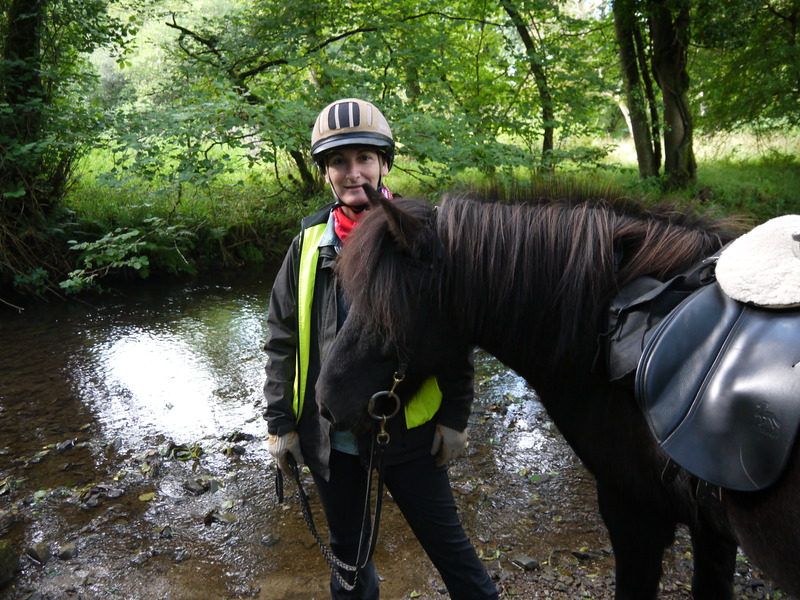 Here is what the Woman wrote…..
“One of the things we love to do with our horses is “ramble”. A quick brush, check feet, tack up and head out. Our Icelandic horses are perfect for this. 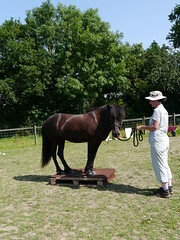 Easy to manage on the ground, easy to get on and off, sure footed and hardy. One of the other things I love is the Gower peninsular, in South Wales. This is the place where I have spent most of my holidays since I was three years old. As I child I would practice my ‘horse whispering’, with the semi feral mountain ponies on the commons, and ache with envy when I saw someone riding a horse along the beach. 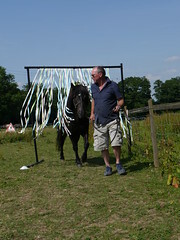 Finally, aged 40 something I met the love of my life, Roger, and bought my first horse, a Welsh Cob called Beanie. 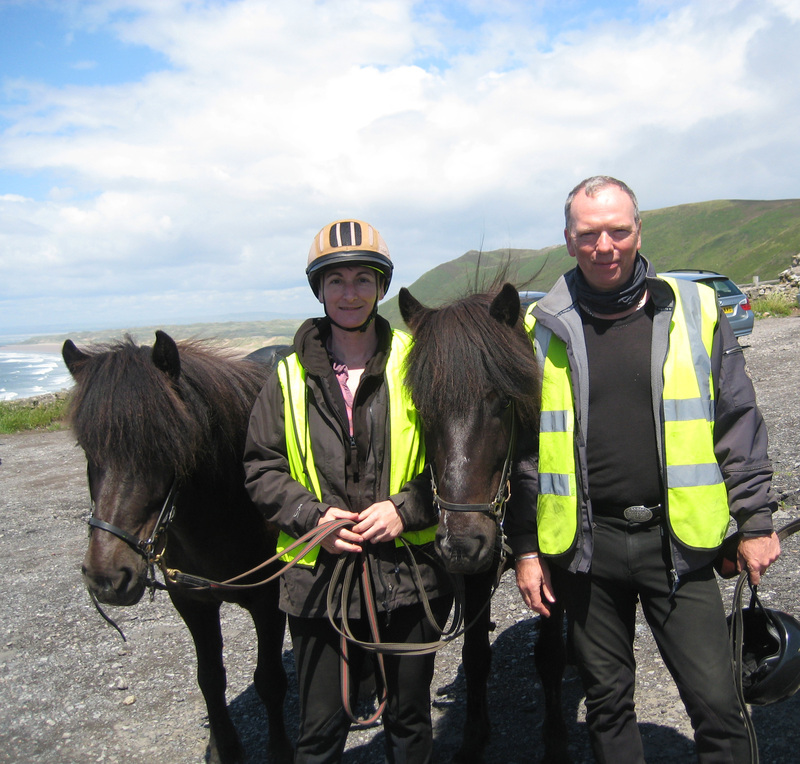 Roger and I now have four horses, Beanie, and three Icelandic’s – Fleygur, Svipur and Gydja. So, now I get to combine all the things I love, as we take our horses on holiday with us to Llangennith, on Gower, each year. Just over a mile from our caravan is Tankey Lake Livery. 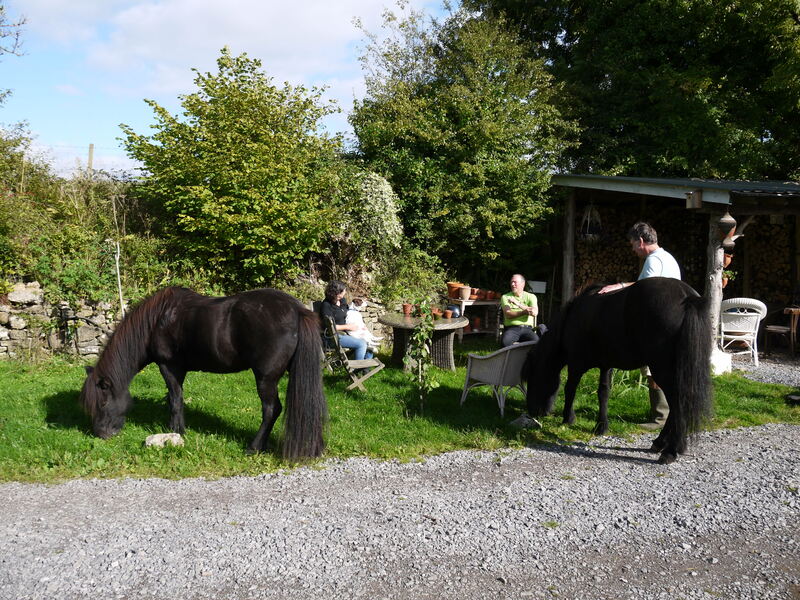 It’s a friendly, lively yard where nothing is too much trouble for Sharon, who runs the place, and we, and our horses now see this as our second home. 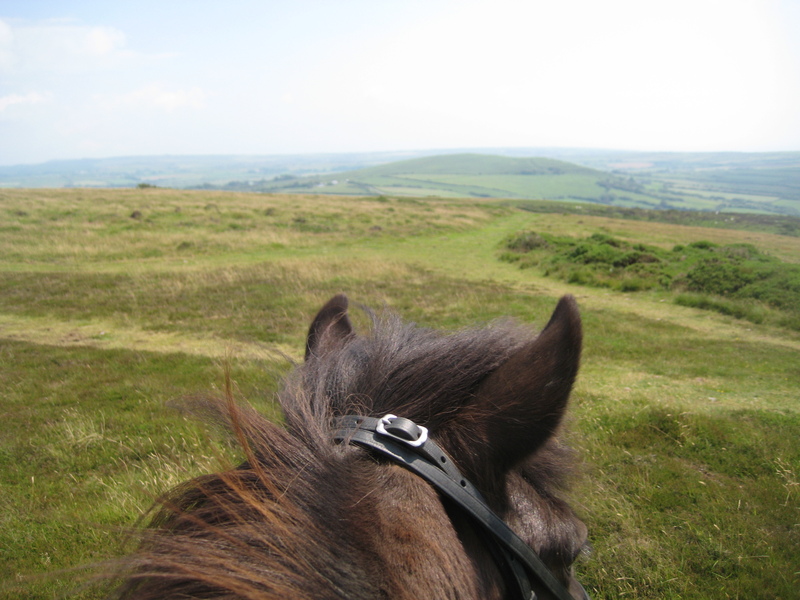 From the yard you can ride directly onto Llanmadoc Hill, without touching a road. Even if that was all there was, that would satisfy a weeks riding, while you weave your way around the various tracks, and make the obligatory stops at the Britannia Inn (which does great food), and Llanmadoc village shop/cafe for tea and cakes – but, that is not all there is. There are another four commons, with equally great views, and route options, all within easy riding distance and with minimal road work. Then of course there are beaches. This year we took all four horses with us for the first time. 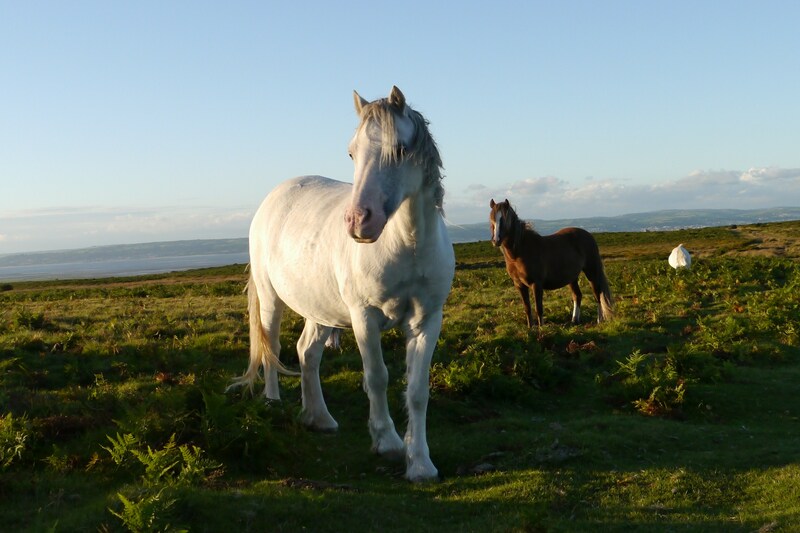 The older horses quickly recognised where they were, and knew immediately which path to ‘suggest’ as the quickest way back to the yard, but for Svipur this was his first time to Gower. He is young, and has only been with us for few months, so we were not sure how he would respond. He was a star, and a real ambassador for the breed. Apart from being admired for his looks, he took it all in his stride and was a pleasure to ride. Even on his first trip to the beach he didn’t put a foot wrong. I wanted to use the opportunity of the beach ride to get a good canter or gallop from him, as he still favours pace when ever he can, and he was great. Leading the gallop and streaking away from Beanie, and Sharon’s cob, Keano – I was, once again living my childhood dream. 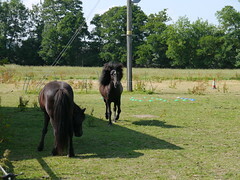 For a moment Roger thought that I had lost control, as we galloped on when the others pulled up – but Svipur and I were just having too much fun! As soon as I asked, he slowed , and then stopped, and then walked as calmly as he had before the gallop. Of course Wales, like Iceland has changeable weather, but even knowing this, I foolishly set out for a ride one day without any waterproofs. We had just made it onto the second common when, glancing over my shoulder, I saw the rain approaching. We turned for home, and our usual gentle rambling was abandoned in favour of some fast tolting, trotting and gallops, as we tried to out run the weather. We almost made it, reaching the paths above Tankey Lake yard just as the rain started. I wanted to take the lower, more sheltered path, but Roger didn’t want to snag his new Top Reiter trousers on the brambles! So we separated. No problem for Gydja, she gave a little nicker as they left, and then settled. Fleygur, on the other hand, objected and we could hear him screaming from the hill, as Roger led him up to the higher path. On the top of the hill, despite doing a good impression of a really wound up horse, he stood stationary and quiet, on command, for Roger to mount; resuming his calling only once they were underway again. One minute we could hear him some where behind, and above us, and the next, they were way in front. We trotted up to join them, and it was apparent that Roger had enjoyed an exhilarating gallop through the driving rain and wind on the top. Galloping is not the norm for us however, and our riding would probably be considered sedate by many. 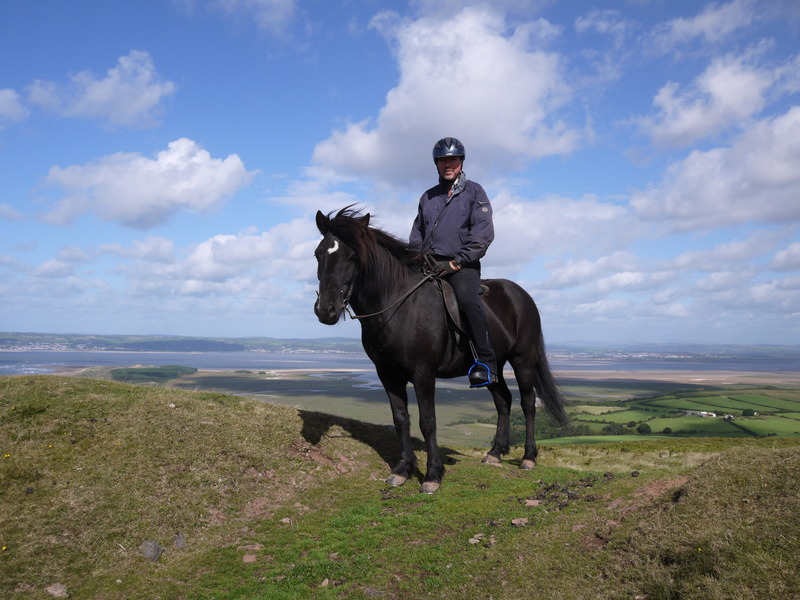 It is our habit to ride for a while, and then get off and lead, particularly up the hills; we ride for about fifty minutes and then walk for about ten minutes. As we do not have the option of riding Icelandic style, with a herd of spare horses, this enables us to be out for a number of hours with just two, helps to keep us fit, and builds the bond with our horses. 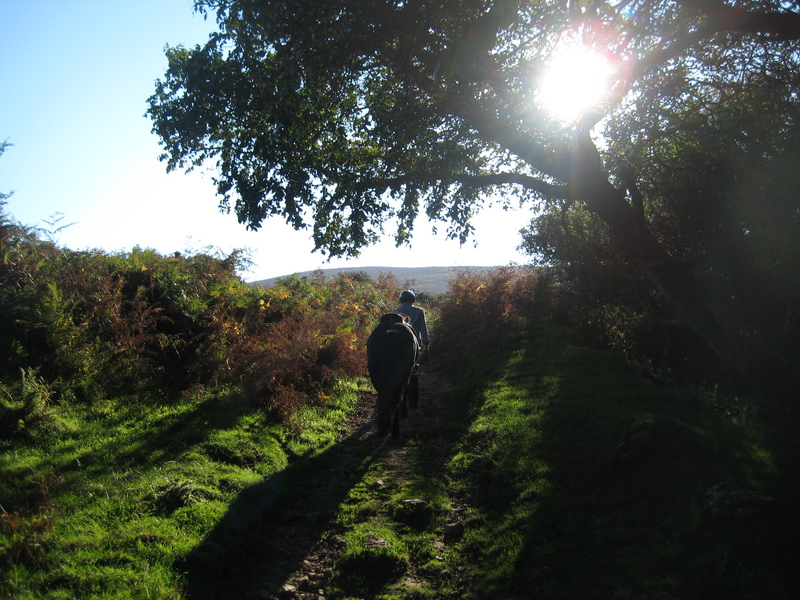 One of these quiet rambles, with Fleygur and Gydja, took us directly from the yard over Llanmadoc Hill, and then, Ryer’s Down. After a lovely canter along the grassy tops, we dismounted for a steep drop into a pretty valley, and a meander along a secluded, tree lined path. The quietness of this route, away from any sounds of traffic, added to the feeling of going back in time, as a further decent on a stony path brought us to a small stone bridge, known locally as the Roman Bridge. We have sometimes stopped at this tranquil spot for a lunch break, but this day we climbed on up the stony tack the other side, emerging into a small clearing, and one of those cottages that starts you thinking, “If I won the lottery….” The couple living there admired the horses, and after we had waxed lyrical about the unique qualities of Icelandic horses for a while, Jonathon and Kath offered us a cup of tea, and the horses a small patch of grass (which they leave un-cut for the wild horses that roam Gower, to graze). We un-tacked and let the horses loose, Roger having finally persuaded me that the grass would be sufficient incentive to keep them close by. Gydja dutifully munched on the grass offered, but Fleygur persistently grazed his was toward the herb garden, and had to be retrieved several times. It was great to make friends with some more of the local people, and as we rode on Fleygur had also secured another fan for his Little Viking Horse blog. 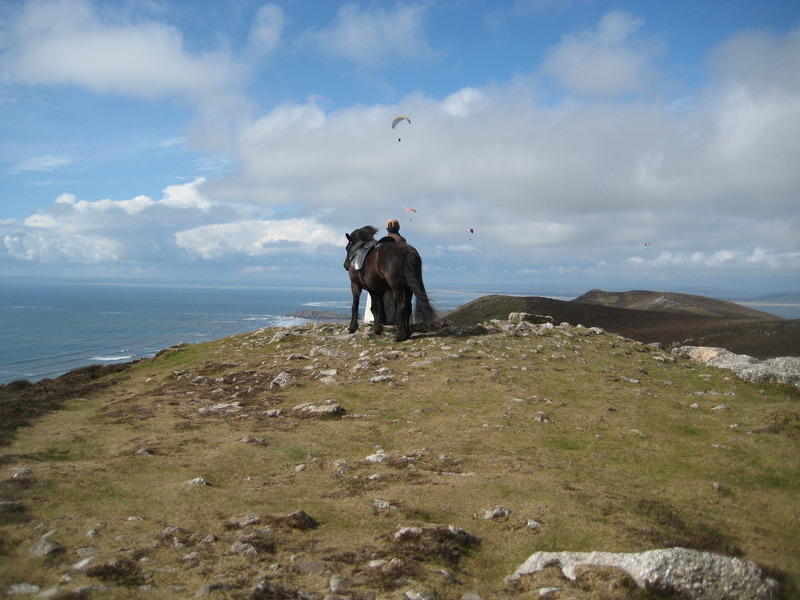 Gower is a truly beautiful place to ride, and I love it what ever the weather. (There is never bad weather, just inappropriate clothing!). This year, despite some very windy and wet days, we also enjoyed some great weather and fantastic riding and we will be back again next year . 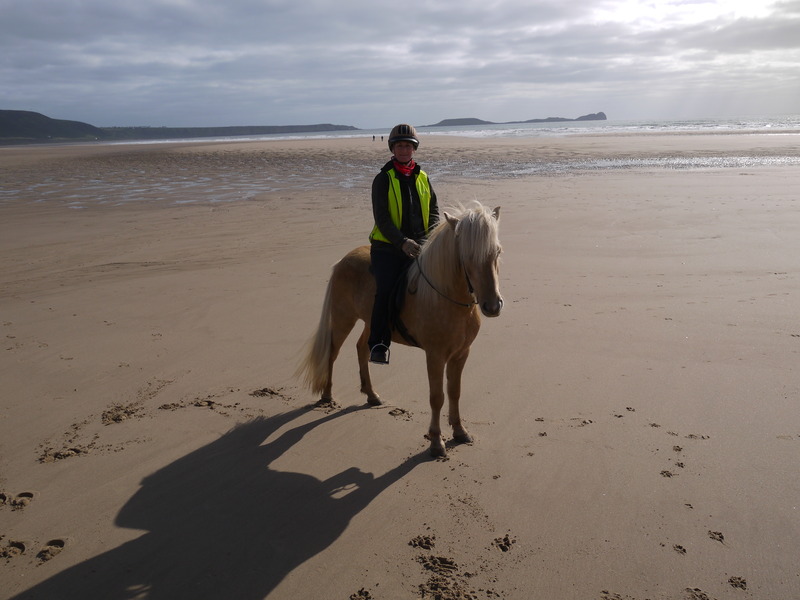 If anyone fancies planning their own trip to Gower we would be happy to share details of our favourite rides, and introduce you to Sharon at Tankey Lake Livery. As well as the campsite, there are Bed and Breakfasts in the village, and self catering cottages at the Livery.” Places to stay.